It’s June 6th and the 67th anniversary of D-Day. The sun is coming up and it is 6 a.m. Squires have been up for awhile and they are eagerly heading for St. Thomas More Church to join other squires. A steady stream of cars carrying veterans, seven students, counselors and teachers from Chapel Hill and Carrboro started loading and departing town. They have started their three-hour journey to Bedford, Virginia, and a veterans memorial nestled on a hillside. 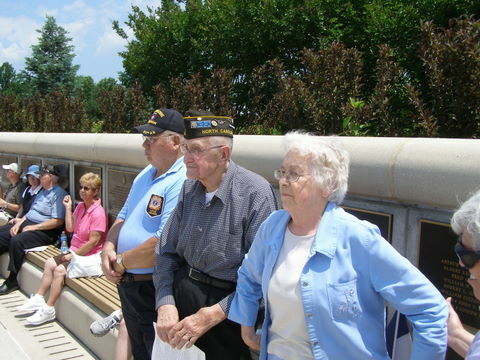 Included in the travelers are local World War II veterans Jerry Pilarski, 82nd Airborne, Gene Drogos, U.S. Navy air crewman, and Louise Drogos, U.S. Navy Nurse Corps. They were about to join others from many neighboring states heading to the National D-Day Memorial and the home of the Bedford Boys. Their mission is to deliver $1,500 raised by the youth of St. Thomas More Catholic Church. These kids were inspired by one of their members who had visited the memorial on an earlier Chapel Hill High School field trip. 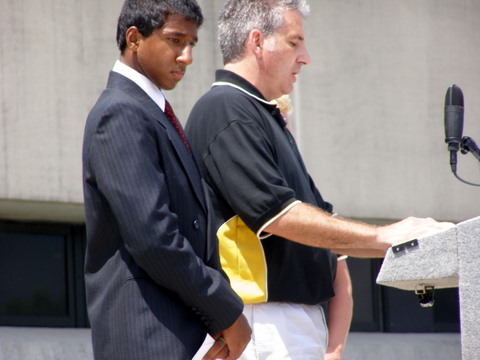 Garcian D’Cruz, a 10th grade student, was moved by the memorial and the World War II veterans he met. He was also saddened when he learned of their financial plight. He told his story to other members of the Our Lady of Guadalupe Circle 5485 of the Columbian Squires. The kids decided to honor all veterans by raising money for the memorial. They purchased potted plants for resale to members of their church and used money from their other projects. Others donated cash. They raised $1,500. 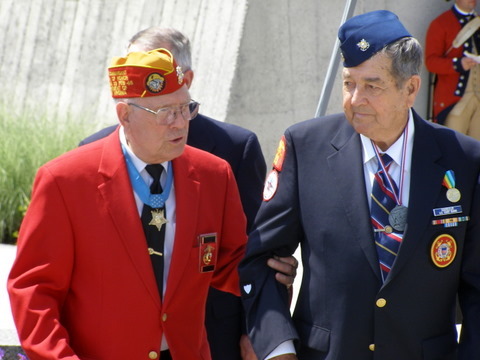 The National D-Day Memorial Foundation was moved by the Squires’ generosity and patriotism and invited them to participate in the 10th Anniversary ceremony for the memorial. Garcian and Mr. Tom Stanfa, Chapel Hill High School 10th grade teacher, stood shoulder-to-shoulder with D-Day survivors, a congressman, civic leaders and a Congressional Medal of Honor recipient “Woody” Williams, as special guests and speakers. Garcian told his story to a crowd of over a thousand participants and spectators. It was a story of local kids making a difference and their efforts to help keep the memorial funded. Their mission was to help preserve the World War II veterans’ legacy by “keeping their legacy living.” His remarks moved the audience. His speech served as the inspiring lead-in to a request for audience participation with a donation. Watch, listen, and be proud. The National D-Day Memorial is ten years old and was dedicated by then President George W. Bush. It has been hit hard by our current economic situation and is fighting to raise money to keep its doors open. The last surviving member of the Bedford Boys died in 2009 at the age of 94. He was Ray Nance.